Yoplait® has joined Facebook to offer a deal to jumpstart your New Year’s Resolution to get fit! They are giving away a million cups of this delicious yogurt. MarkdownMom likes to freeze the cups for a healthy dessert treat–as good as sorbet. Hurry, only a million cups giveaway and when they’re gone, they’re gone! If you wear contact lenses, then you know how aggravating they can be at times. All of us have experienced itchy dry eyes, fogging and let’s not mention what happens when they contribute to an eye infection! Cards are reminders of days past, a snapshot in time. If you are like most families we keep the cards that commemorate those important events such as, birthdays, weddings, retirements, birth of a baby, graduation and more; in so many ways, they are a chronology of our lives. 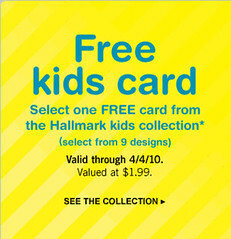 Hallmark is offering a Free Kids Card, approximately 9 selections. This offer is good until April 4, 2010. Remember That Special Kid In Your Life–become part of their memories! Sephora the home of fabulicious cosmetics is known for its’ freebies. When you shop online you can choose product samples for free with every purchase so that you can try the latest cosmetics and scents before you buy. And when you shop in store, oftentimes you can get a free makeup makeover, free samples, and if it’s your birthday during the month, a special birthday present just for you! Markdownmom celebrated her birthday with a special trip to the store which is a treat in and of itself and received a trio of lip gloss kit FREE! Plus by becoming a Beauty Insider member you can receive points for every purchase and they can be cashed in for free products and kits like this fabulous makeup kit. 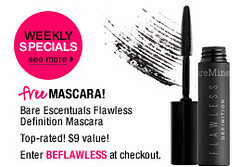 This week get a Bare Escentuals Flawless Defining Mascara FREE with any merchandise purchase online, just enter code BEFLAWLESS at checkout. Become A Fabulous Looking Frugalista With These Freebies! Okay, you’ve decided to turn over a new leaf . No more extreme diets, no more marathons, just a sensible approach to eating healthy and regular exercise. 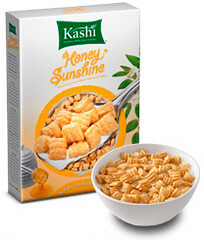 Kashi wants to give you that start jump that new lifestyle with a free sample of their delicious cereal. Wake up your palate and have some fun at this site, too! Great recipes, games and more. Remember, Breakfast Is Your Most Important Meal!!! Hot, Hot Makeup For FREE! 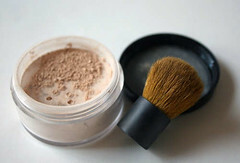 Makeup made by minerals has been a hot item for the past year, now you can DIY and save beaucoup bucks! A healthy alternative with no preservatives, get the load down on how to go about making your own at Makezine. Learn how to do this step-by-step, a great site for the DIYer and those who just want to save money! Or, if you aren’t handy then check out this bargain from i.d. 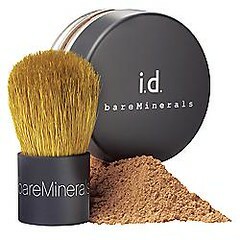 bare Minerals. Get their Peace And Love Sample FREE! Sample includes your shade preference foundation and Premi Buki Brush. Pay only $3.95 for shipping. Perfect travel size. While you’re there check out other deals, plus send an email to a friend about this freebie! Unless you’re postmenopause, or you have opted to try the new meds to limit the monthlies to a few times a year, sanitary pads for women and girls are a part of life. Kotex® is offering a free sample pack of its’ products including its’ new ultra thin, ultra light pad with wings. Feel funny about “that talk” with your young daughter? This is a perfect opportunity to initiate it with this great freebie packet. Plus at the site check-out sweepstakes, new product offers, and educational information!